Every adventure path has a particular theme and style to it, which identifies it and makes it distinguishable from other adventure paths. Iron Gods has technology and aliens, while Mummy’s Mask involves exploring ancient tombs and battling undead. Giantslayer, not surprisingly, is all about giants. Adventure paths also need a certain amount of variety, though, as too much of the same thing can start to feel stale. Stray too far from the core concept, however, and the different segments of the adventure path might no longer feel like a connected whole. It can be a fine line between how much “same” and how much “different” an adventure path needs to work. With Giantslayer, I’m starting to feel that it’s leaning towards too much of the same. The fourth instalment, Ice Tomb of the Giant Queen by Jim Groves is structurally very similar to the two adventures immediately preceding it, The Hill Giant’s Pledge and Forge of the Giant God. That’s not to say that Ice Tomb is a bad adventure. It’s actually pretty good and there’s a lot I like about it, but in it, the PCs must undertake a mission of infiltration and sabotage just like they’ve done twice already. Of course, as they’re higher level now, they have more options for how to go about their mission and they face more powerful opponents, but in the end it still feels repetitive. It’s exacerbated by the fact that this is not just the third time overall, but the third time in a row. That aside, there’s a lot that’s very good in Ice Tomb of the Giant Queen. It has a dynamic and vibrant setting that provides a good sandbox location for the adventure to take place in, and it has lots of interesting encounters to challenge a party of 10th-level characters and entertain their players. It also has an innovative system for determining how their giant opponents respond to the PCs’ actions. 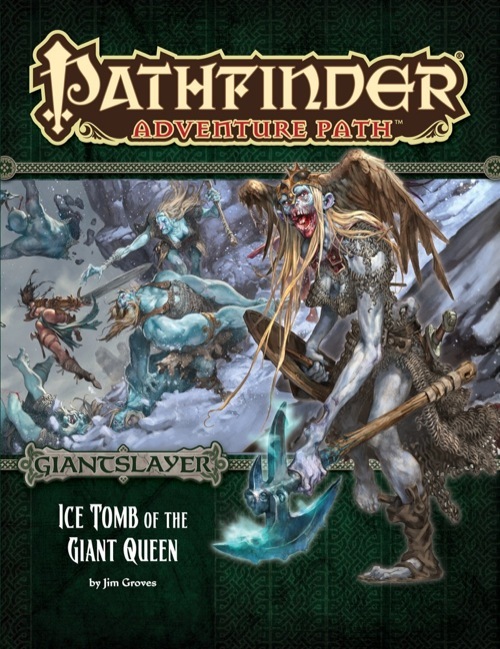 At the end of Forge of the Giant God, the PCs should have learnt of a giant training camp in the frost giant village of Skirgaard, and Ice Tomb of the Giant Queen begins with the PCs arriving at the village (the journey there is skimmed over, since there are numerous different methods the PCs might use to get there, and it’s up to individual GMs whether they want to detail the travel time). At Skirgaard, the PCs need to find a way to break up or otherwise disrupt the training going on here for the Storm Tyrant’s army. However, there are too many giants here (both the local frost giants and the numerous other giants that have come to train) for the PCs to take on in open combat, so they must use other means to accomplish their goals. Ultimately, they need to make the giants lose faith in the Storm Tyrant’s military campaign, so that they disband and leave. Like the preceding couple of adventures, Ice Tomb requires that the PCs be self-motivating. No one hires or directs them to come to Skirgaard, and they pretty much need to figure out their objectives on their own—although some help may come in the form of an unusual potential ally (more on that later). This continues to be one of the things I really like about Giantslayer, as it moves away from the standard Pcs-work-for-someone-else model that roleplaying adventures very frequently follow. Since killing all the giants is not a feasible option—and hopefully by this point in the adventure path, the PCs have realised they can’t just go around killing everything in sight—the PCs need to use a stealthier approach. This is best achieved by calculated strikes at locations in Skirgaard, the loss of which will make things harder for the giants. Examples include poisoning the giants’ meals, or releasing the mammoths they keep for mounts and foodstock. Eventually, the PCs will need to face some of the more prominent giants in Skirgaard, most especially Skirkatla, the queen of the title, who is an undead graveknight. Travelling into her tomb forms the second part of the adventure. While the PCs could technically attempt that at any time, they will be better off if they have dealt with the rest of the village first. In an adventure where the PCs’ options are quite open-ended, it can be difficult for GMs to decide how the PCs’ opponents react to their actions. Just how much disruption do the PCs have to cause before the giants decide their war-training effort just isn’t worth it? Luckily, Ice Tomb of the Giant Queen contains a system for GMs to determine this. Throughout the adventure, the PCs actions earn them Sabotage Points or Outrage Points (sometimes both). Sabotage Points track how discouraged the giants are becoming. Once the PCs reach 20 Sabotage Points, most of the giants pack it up and leave. The only ones who stick around are mostly the frost giants who already lived there before the training camp started up. Reaching 20 Sabotage Points is ultimately one of the PCs two main goals in the adventure (the other is to destroy Skirkatla). Outrage Points on the other hand measure how annoyed the giants are becoming. The PCs receive Outrage Points when they do things that are just a little too noticeable, things that the giants can’t assume were just accidents or acts of incompetence by some of their own. If the PCs reach 20 Outrage Points, Skirkatla herself emerges from her tomb to face the PCs, probably backed up by several of the other nasty denizens that also dwell in her tomb. The PCs are best off if they acquire as few Outrage Points as possible. Every encounter location includes information on how many Sabotage or Outrage Points the PCs will earn for various different actions they might take there. There is also advice for awarding points for actions that aren’t covered in the text, and a table indicating how the giants adjust their activities based on the PCs’ current Outrage Points. On the whole, the system looks very good, and helps give both PCs and GMs a tangible way of determining how close they are to achieving their goals. I also like that the village of Skirgaard is not just a static series of location-based encounters. While the text presents most of the village via keyed locations, there are clear guidelines on how and when the locations are used. There are methods for communication between locations (including an alarm system that involves fireworks), and schedules for patrols (which change based on the number of Outrage Points the PCs have accrued). For the most part, Skirgaard feels like an active place. I particularly like that denizens of the tomb will sometimes come out (on Skirkatla’s orders). It helps keep the tomb from feeling like it’s a completely separate location from the rest of the village. That said, while I was reading the adventure, something kept feeling off, and it took me a little while to figure out what it was. Skirgaard is very well designed for PCs to adventure in; unfortunately, it also feels that way—as in, it feels designed to be adventured in rather than lived in. Notably, the village lacks accommodation for the giants who live there. There is the main camp for the giants who have come here from elsewhere to train, and some of the locations have places for the giants who work there to live and sleep (for example, the brewery has quarters for the frost giant brewmaster), but there just isn’t enough space for all the frost giants who actually come from Skirgaard, unless they have a very small population. Strangely, there is no stat block for Skirgaard itself (very unusual in Pathfinder adventures) and no indication anywhere of what the actual population is, beyond vague statements of a lot. There’s no indication of how many native frost giants there are, nor how many other giants from elsewhere. It very much seems like the total population is whatever it needs to be for there to be too many for the PCs—which is all right, I suppose (if the adventure acknowledged it), but it still seems strange that Skirgaard has so few places for its native population to reside. All it really needs is some houses or similar buildings for giants to live in. As it is, the only building that is actually designed for living in (as opposed to some other task like the smithy or mess hall) is the longhouse of the frost giant sub-cheiftain Gregganor. It has accommodations for Gregganor himself and barracks for his personal guard. On the whole, this doesn’t impact the adventure a great deal. It just creates that slightly off feeling. However, it’s easy enough for GMs to simply add some houses in the open areas of the village. The PCs don’t need to go to these homes, so they are ultimately just colour. Once the PCs enter Skirkatla’s tomb, the adventure becomes a dungeon crawl, and while there are some good encounters in the tomb, this is the less interesting part of the adventure. I will fully admit, though, that my own biases (which include a general boredom with a lot of dungeon crawls) are at play here. The tomb is quite large—both from the perspective that it was built for giants and that there are a lot of chambers in it. This is not a dungeon that will fit on a single battle mat, or even two. A couple of the rooms are big enough by themselves to take up most of the space on a battle mat (if they fit at all). The map of the tomb has a scale of 1 square equalling 10 feet, which is awkward for transferring to miniature scale, but is probably unavoidable when dealing with a location scaled for giants. One thing that helps elevate the tomb beyond just a standard dungeon crawl is the aforementioned fact that some of its denizens will sometimes leave the tomb and enter the village (particularly if the PCs get a lot of Outrage Points). Indeed, there are several interesting NPCs who reside in the tomb, including a couple of tomb giants (a new kind of giant introduced in the volume’s Bestiary), one of whom spends most of his time creating new kinds of undead for Skirkatla. Naturally, the PCs will face some of these at some point or other, including a beast called the baelmourn, which is a patchwork juggernaut made from the skeletons of many giants. That said, Ice Tomb of the Giant Queen is not really an adventure about NPCs. The PCs aren’t likely to spend a lot of time interacting with the residents of Skirgaard or the tomb. As such, there aren’t actually a whole lot of detailed NPCs in the adventure. Even Skirkatla is not a very interesting character. However, she is a very interesting encounter. As a graveknight, she has a lot of additional abilities that standard frost giants don’t have. Notably, graveknights have immunity to one energy type associated with their deaths. In Skirkatla’s case, this is fire. In an adventure where a large number of the opponents are frost giants, who are vulnerable to fire, it provides a (potentially surprising) twist for their final opponent to be immune to fire. One exception regarding NPCs, however, is the red dragon, Naximarra. Although Naximarra is Chaotic Evil like most of her kind, she is not necessarily an antagonist for the PCs. She is secretly spying on Skirgaard from the outside. Early in the adventure (the exact timing is left to the GM), she contacts the PCs offering an alliance. Naximarra can provide the PCs with a lot of information if they take her up on the offer (although they are, by no means, required to do so—some groups may simply decide to kill her). In particular, they can learn that the Storm Tyrant possesses an Orb of Dragonkind and is using it to enslave red dragons. Naximarra has not been enslaved, but is a descendent of the original red dragon imprisoned in the Orb, and as such, she has the ability to destroy it. She is working against the Storm Tyrant, but must do so secretly or else risk being enslaved by the Orb. While she is limited in how much aid she can give the PCs in Skirgaard, she can provide information about the inhabitants and offer advice. I like the connection Naximarra provides with later parts of the adventure path, helping it all to feel connected. So far in Giantslayer, while there has been the overarching plot of the Storm Tyrant building his army, the adventures are rather disconnected from each other. After the PCs finish each one, they move on to another location (generally a large distance from the previous adventure). There have been no recurring NPCs. Naximarra breaks with that pattern (assuming the PCs don’t kill her) and creates a bit more of a link between adventures. I really like the support articles in this volume. The first is “Armored Fiends” by John Compton, which presents brief histories and backgrounds for several other graveknights across the Inner Sea region of Golarion. The article does not provide game statistics for these characters, other than the armour type each one wears (a graveknight’s armour is the source of their power) and the energy type it is immune to. I like that it takes this approach. While it does create more work for GMs who want to use any of these graveknights, it allows room for more of them, which I think is more useful in this case. The second article, “Titanic Alliances” covers various organisations across Golarion run for, or by giants, as well as a brief bit of information about giant members of other organisations like the Aspis Consortium. What I like about this is it gives more substance to giants and makes them feel less like random monsters and more like creatures with actual societies and goals. The Bestiary contains the aforementioned tomb giants, who, while not undead themselves, have several necromantic abilities for controlling and creating undead. There is also an undead giant called an indarugant, living effigies, and a couple new kinds of outsiders, birelus and thremindyrs. The latter feature in the adventure as well. On the whole, I like Ice Tomb of the Giant Queen quite a bit. My biggest issue with is the repetitive quality it has to it. After two adventures which involve the PCs having to sneak into areas of significantly more powerful forces, it would have been nice for something a little different. I also worry that the next adventure, which puts the PCs up against the fire giants who are training the most élite soldiers for the Storm Tyrant’s army, will be more of the same again. Every adventure path needs a bit of variety to it, and Giantslayer could use a bit more.